Presentation Secondary School Waterford continued its tercentenary celebrations with the staging of a beautiful performance of Woman of Welcoming Heart in the old convent chapel. This musical, written by musician Tom Conroy, is all about the life of Nano Nagle, the foundress of the Presentation sisters. This very special occasion was attended by the Presentation sisters, who thoroughly enjoyed it, and by the composer himself, who was greatly impressed by the performance. The school is celebrating some great sporting success recently. The school congratulates past pupil Beth Carton on receiving an Allianz Senior Camogie Award. Beth is the first-ever Waterford senior camogie player to win an All Star award. Congratulations also to Opeoluwa Olajide and Katie Whelan who have made the Munster under 15 basketball panel. 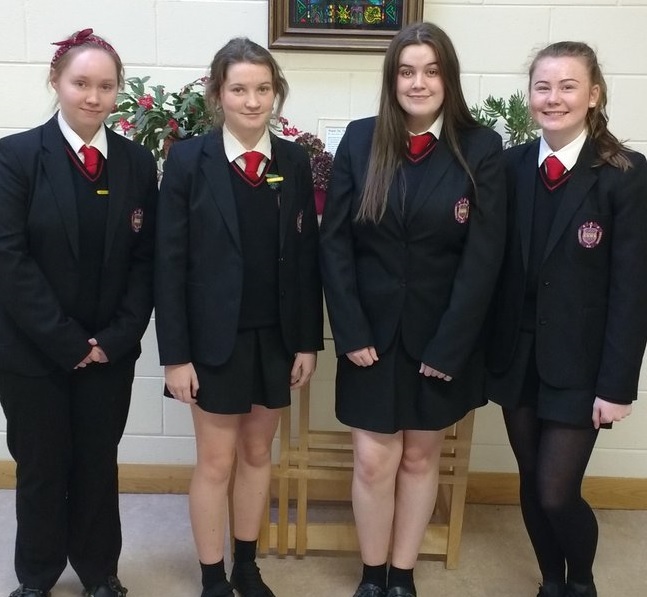 Best of luck to fifth year students Eilís Cosgrove, Gráinne Browne, Dawn O’ Neill and Grace Malone who took part in the Lions Club Youth Ambassador interviews. These girls have been selected to represent the school, based on the contribution they make to their local community.